Kyle Hoyd received an associate degree in Forest Resource Management from The Pennsylvania College of Technology and a Bachelor’s degree in Forestry from West Virginia University. In 2000, he started work as a climber for Brown Hill Tree Co. and later became owner/operator for Hoyd Inc., where he focused his business on removals and proper pruning practices. 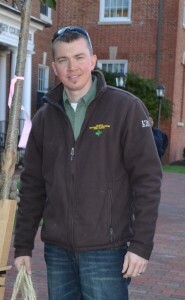 Kyle came to work for the Delaware Forest Service in 2004 as the state’s urban forester and later became the Urban Forestry Coordinator in 2010. During his time with the urban forestry program Kyle worked with all 57 municipalities to better their natural resources through proper management and tree canopy goals. In 2014, Kyle became the Assistant Forestry Administrator where he manages the agency’s wildland fire program, forest legacy program and open space program. Kyle enjoys hunting and spending time with his wife and two children.